The Healthy Weight Initiative for Nurses (WIN.) was a bold, ambitious project tackling a sensitive issue: raising awareness of obesity in the nursing profession and engaging nurses themselves in how to address this. We used innovative approaches to obtain insight into nurses’ attitudes and involve them in the co-design of interventions. WIN. has produced an important body of work that warrants following up by the partners, employers and other stakeholders, and has the potential to improve the health – and therefore the effectiveness – of health workers. WIN. was a partnership between C3 Collaborating for Health (C3), London South Bank University (LSBU) and the Royal College of Nursing (RCN), with funding from the Burdett Trust, the RCN and the RCN Foundation. Its aim was to work with registered nurses in England who are obese to design interventions that will help nurses achieve and maintain a healthy weight. Scoping, involving a review on interventions to address obesity in nurses, a prevalence study of obesity in nurses in England (which made national headlines in December 2017), and detailed design and piloting of data collection tools. Insight, involving getting views from nurses on their attitudes to obesity and the barriers to losing weight in the workplace. Co-production, involving workshops where nurses discussed and designed interventions. To read more about WIN.’s achievements and findings, download the Healthy Weight Initiative for Nurses (WIN.) final report. 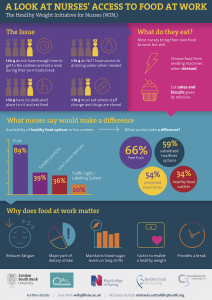 Download ‘A look at nurses’ access to food at work’ infographic. Kelly, M. and Wills, J. 2017. What works to address obesity in nurses? An in-depth review. Occupational Medicine. Wills, J. and Kelly, M., 2017. Investigating the attitudes of nurses who are obese. Nursing Standard, 31(46), pp.42-48. Interested in our work with nurses? Read about NURSING YOU, an interactive tool designed by nurses, for nurses as a part of the WIN. project. Through collaboration with MAXIMUS, it is now moving forward as an online portal. Workplace cake culture: health risk or sociable morale booster?